It’s going to be warm this week, but the seasonal worm has turned. How do I know this? There are programs two weeks in a row at upcoming Drinking Liberally gatherings. Very unsummerlike. 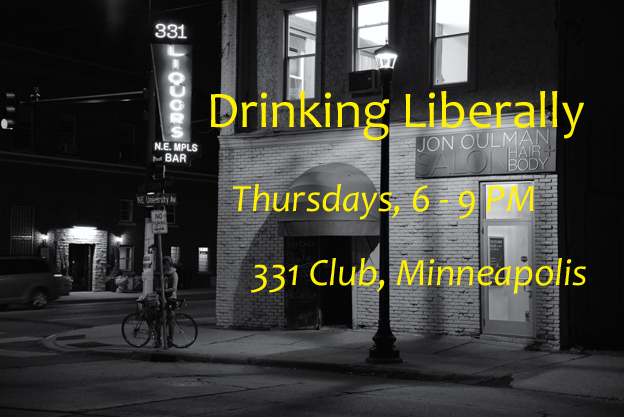 For the uninitiated — and sadly, there remain a few — Drinking Liberally meets in Minneapolis every Thursday evening at the 331 Club. The group starts to get together at six (some stalwarts earlier) and we’re there until nine. Or so. If there is a program, it starts at seven. This week, on Thursday, September 17th, the Executive Director of Common Cause – Minnesota, Jeremy Schroeder, will speak to our group about the outsized influence of money in politics and what Common Cause is trying to do about it. Jeremy will speak at seven, and there will be time reserved for your questions. Next week [in italics for the inattentive], on September 24th, we’ll have a discussion about two of the most interesting upcoming political races in Minnesota, and we’ll be joined by DL friend Michael Brodkorb; Michael always has interesting and insightful remarks, and his comments about one of the races ought to be especially enlightening. Joining Michael on the stage will be an as-yet undetermined assortment of DL hosts. In a recent surprise statement, Second Congressional District Rep. John Kline announced that he would retire at the end of his current term, setting off a mad scramble among Republicans to replace him. Except not really, so far. David Gerson is the only announced Republican at the moment; Dave Thompson and Roz Peterson are out (the former is a surprise to me). Mike McFadden and Steve Drazkowski are thinking about it, as is apparently Mary Pawlenty, the spouse of Governor Gutshot. Which might, or might not, be helpful to her. Update: McFadden sez no. We’ll also discuss the soon upcoming primary election to fill the seat vacated by the death of David Dill in Minnesota’s House District 3A. This is a pretty safe DFL seat, but the primary promises to be wild. Curiously, the DFL party unit had decided not to make a endorsement in the race. One of the candidates, Bill Hansen, a business owner (a canoe outfitter) and activist, did get the endorsement of the DFL Environmental Caucus. The primary is the following Tuesday, the 29th of September. There will be time for your questions, too.